Tilted Horizons: No April Fool: RevZilla Giving Away Motorcycle Gear Again! 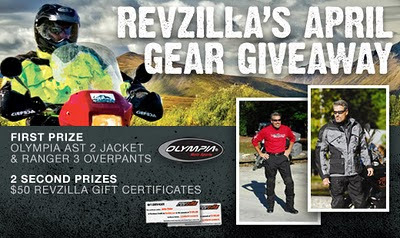 No April Fool: RevZilla Giving Away Motorcycle Gear Again! Our friends at RevZilla are giving away inventory again. So how does one go about taking advantage of this apparent temporary lapse of business reason? Login to RevZilla's site, spend all of about 30 seconds creating a rider profile, than sit back and wait for the monthly winners to be drawn. Could it be any easier to try to win some top-notch sport-touring/adventure riding gear? The First Prize winner this month will receive both an Olympia AST 2 jacket and Olympia Ranger 3 overpants, modeled in the pix above by that "Olympia guy" at whom we've enjoyed poking much fun over the years. $50 RevZilla gift certificates will go to two Second Prize winners. To enter, click on over to https://www.revzilla.com/april11-contest ASAP! While you're there, take a look around at what RevZilla has to offer the serious motorcyclist. Why shop RevZilla? I can tell you why I do: fast, free shipping for orders over $39.99; TeamZilla cash back program; "no hassle" exchanges; price match guarantee; and above all, RevZilla's top-flight reputation among riders I know for its customer service and product knowledge. Let 'em know Tilted Horizons sent ya!